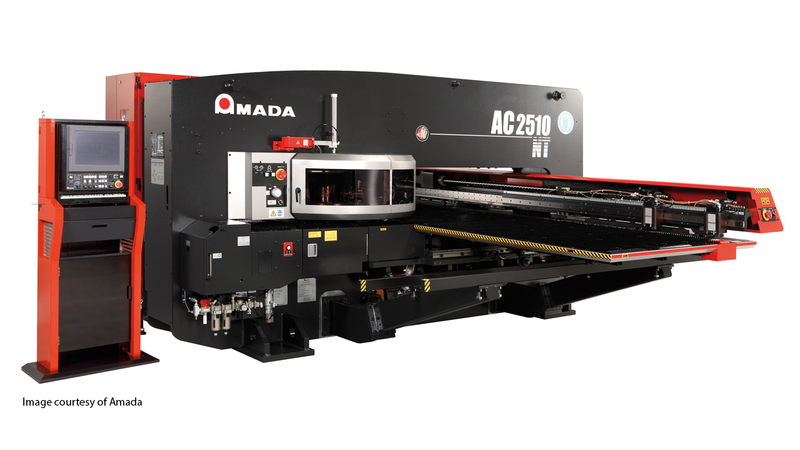 The AC series from Amada has two models available, this one and the AC-255 NT. This AC CNC punching machine has a brush table and a lifting brush table for high quality; scratch free processing that can be controlled to lift about 5 millimeters, which helps prevent scratching the metal part. The punch machine from the AC series has great equipment features including a brush table, lifting brush table, roller table support, air blow, sheet sensors for deformation, tool lift, a slug removal punch and power vacuum, a 300x300 millimeter work chute, and an interface for automation and conveyor belt control. Some of the extended functionality from the AC series includes a work chute tool, a slotting tool, an inch bend tool, and a marking function that can add part marking up to 900 strokes per minute with alphanumeric characters. Merry Mechanization’s sheet metal software, SMP, has handled many of these machines over the years.